Benefits Of Access Control | Calgary Alarm Inc.
Access control, an electronic card that is given to employees to gain access to a building, is of great benefit to commercial businesses as access control only allows authorized individuals to enter the building. Immediately, you can see the security benefits that access control offers, but there’s also more. Given that access control limits who can gain entry into your place of business, the possibility of someone entering the building and harming you, your employees or other assets is significantly reduced. Each time you hire a new employee, you will not accrue the extra cost of having to make an extra key. Access control can in turn make payroll more efficient by inputting the data electronically instead of employees manually entering in attendance information. This leads to even more savings over time. In addition, by limiting access to certain areas of the building (such as access to a room with a printer), you can ensure that only the people who have access to the printer are making copies, reducing the chance that outside people are using your own resources. In some cases, an access control card can give allowance to only certain individuals to print or photocopy. Both scenarios lead to increased savings. Access control also makes it possible to monitor when your employees enter and exit the premises. 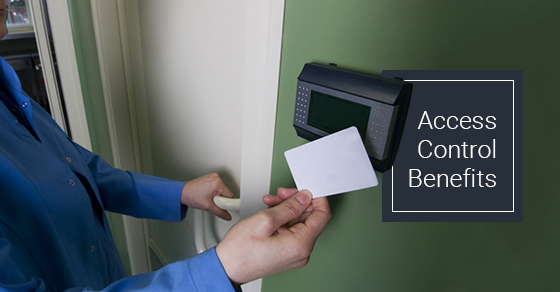 This makes access control a practical tool, allowing business owners to monitor attendance. Another practical benefit is that you can offer temporary access to someone who needs to enter the building, such as a contractor. This is particularly important for places of business that have a lot of people entering and exiting (or have temporary workers), as you will not have to worry about the inconvenience of continually permitting access. Access control also makes it possible for you to control which employees have access to each part of your building. For example, you can limit their access to certain areas of your business or restrict the hours at which various personnel can enter the building (for example, only permitting cleaning staff to enter after regular working hours). Your employees will feel more confident in knowing that you take their safety seriously.